When I started getting more into graphic novels and comics, I figured that it was time to start getting back into using the library. Unfortunately, my local library’s opening hours have been reduced significantly over the last couple of years, leaving only a two hour window available to those of us that work full time. Really, though, that’s no excuse for me not to use it. I live about a five minute walk from the library. Using it makes me feel as though I’m proving in some small way that it’s still a valuable part of the community. Rather than spending a not insignificant sum starting a comic series that I’m not sure about yet, I can spend 90p to get my local library to source a copy from across the city and bring it to my village for me. 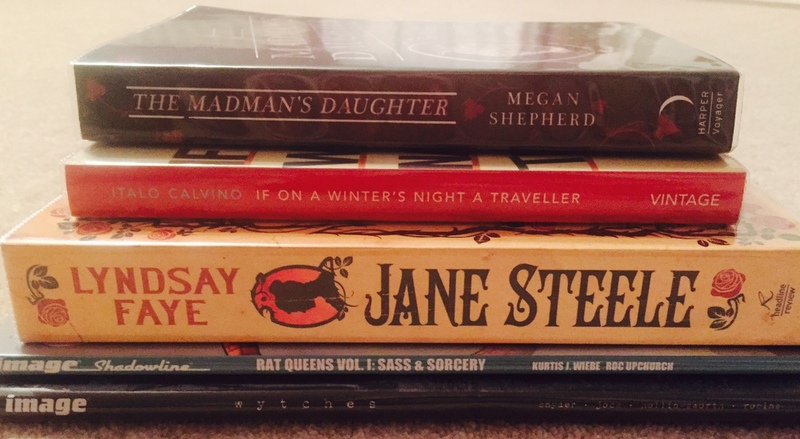 Once I’d started ordering a few comics, I got a bit click-happy and reserved a couple of other books that were high up on my wishlist but that I now can’t buy because I’ve promised Boyfriend that I won’t buy books while we’re saving for a wedding (I know – I’m a fool). It turns out that the Leeds library system has a lot more rattling around in it than I gave it credit for! 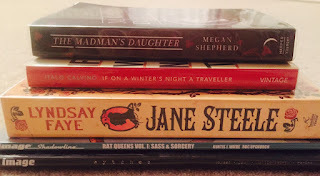 The Madman’s Daughter by Megan Shepherd has been on my wishlist for a long time. I was first interested in it when it was first published just because it sounded deliciously creepy. Then I listened to The Island of Dr. Moreau by H. G. Wells and, while looking into that story, finally noticed that The Madman’s Daughter tells the story of Dr Moreau’s daughter and that the later books in the series play similarly with Robert Louis Stevenson’s Jekyll and Hyde and Mary Shelley’s Frankenstein. They sound excellent so I’m desperately hoping that I won’t be disappointed. The next one on that pile is a multi-renewer: If on a Winter’s Night a Traveller by Italo Calvino. I actually first picked this one up in February and I still really want to read it but I’ve just not quite got round to it yet. Jane Steele by Lyndsay Faye is a recent release and one that was still being acquired by the library when I ordered it. It’s been a few years since I read Jane Eyre but I remember how much I loved it. It’s one I’d love to re-read one day and I don’t say that lightly. This gothic re-telling just sounds brilliant, though. The opening to the blurb goes: “Like the heroine of the novel she adores, Jane Steele suffers cruelly at the hands of her aunt and schoolmaster. And like Jane Eyre, they call her wicked – but in her case, she fears the accusation is true. When she flees, she leaves behind the corpses of her tormentors“. It sounds dark and ever so slightly twisted and as soon as I’d heard of it, it was straight onto my wishlist. Alas, the ‘no book buying’ thing interrupted and I had to hunt Jane Steele down elsewhere. The last two in the picture are comic volumes: the first volume of Rat Queens by Kurtis J. Wiele and the first volume of Wytches by Scott Snyder. Both are volumes that I really nearly bought when we were in the US but instead I plumped for volume 3 of Fables and these two were left to languish on my wishlist. Rat Queens sounds like a lot of fun (come on – the first volume is called Sass and Sorcery!) and promises me the adventures of “a pack of booze-guzzling, death-dealing battle maidens-for-hire”. Wytches looks like it’ll frighten my socks off but I’ve heard really great things about the series so I want to give it a try. At least this way, if it’s too scary, I can return it and pretend it never happened! 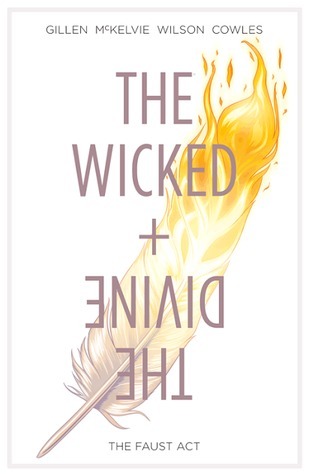 I’d also borrowed the first volume of The Wicked + The Divine by Kieron Gillen but I’d read that and returned it before I remembered to include it in a picture! It was quite readable and I did enjoy it but I’m just not sure that it’s that coherent as a start to a series. I think I’ll carry on with the series and I’ll include more in a mini review at some point but I just…I’m not sure about it really. And that’s my current library stack! It’s funny how after all this time, I still get a kick from wandering into the library and getting to leave with an armful of books and without a large dent in my bank balance. What’s not to love? And what’s hanging out on your ‘to read soon’ pile? Any of these I need to really get into without any more shilly-shallying?